Vegetable is an edible plant or its part, intended for cooking or eating raw, whose fruits, seeds, roots, tubers, bulbs, stems, leaves, or flower parts are used as food. Vegetables are relatively cheaper and rich source of vitamins, carbohydrates, proteins and minerals. Their consumption gives taste, palatability, fiber for digestion, increases appetite and checks constipation. The objective of this article is to assess the some insect pests of summer vegetables, their identification, occurrence, damage and adoption of management practices. Various insects and mites cause damage to vegetable plants at all stages of growth including aphid, thrip, whitefly, leafhopper, two spotted spider mite, squash bug, pumpkin beetles, flea beetles, hadda or epilachna beetles, eggplant shoot and fruit borer, cutworms, hornworms, tomato fruit borer, tobacco caterpillar and melon fruit fly. Most of the vegetables are susceptible to pest damage, and their seeds, roots, stems, leaves as well as fruits are all subjected to injury. Vegetables damage ranges from reduced plant vigor to plant death and ultimately heavy crop losses occur. A combination of pest control strategies is of paramount importance and usually works well to reduce damage and keep the insect population below economic injury level for minimizing the yield loss. Pest identification of the vegetables is the most important step and the correct identification of pest troubles is the beginning of a successful integrated pest management program. The integrated pest management (IPM) include use of mechanical and cultural strategies, use of tolerant plant varieties, growing healthy seedlings, practicing adequate field sanitary measures particularly removing the fallen leaves, buds or debris, undertaking weekly field checking to spot out the presence of the insects, conservation of natural control agents, application of need based insecticides and ensuring of community approach for all the suggested tactics to maximize benefits. This article is one of very few studies which have looked onto some important insect pests of summer vegetables, their identification, occurrence, damage and adoption of management practices for their control. Ultimately, practical vegetable plant protection contains detailed information on pest monitoring; keeping insect infestations below significant levels through preventative measures and specific control of pests which are the core of long-term integrated pest management. Ahmad, N. and M. Sarwar, 2013. The cotton bollworms: Their survey, detection and management through pheromones: A review. Journal of Agriculture and Allied Sciences, 2 (3): 5-8. Alam, S.N., M.A. Rashid, F.M.A. Rouf, R.C. Jhala, J.R. Patel, S. Satpathy, T.M. Shivalingaswamy, S. Rai, I. Wahundeniya, A. Cork, C. Ammaranan and N.S. Talekar, 2003. Development of an integrated pest management strategy for eggplant fruit and shoot borer in South Asia. Shanhua, Taiwan. AVRDC- the world vegetable centre. Technical Bulletin No. 28. AVRDC Publication No. 03-548. 13: 23. Gruda, N., 2005. 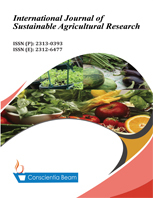 Impact of environmental factors on product quality of greenhouse vegetables for fresh consumption. Critical Reviews in Plant Sciences, 24 (3): 227-247. Mohamad, B.D., R.C. Bhagat and Q. Ajaz, 2011. A survey of insect pests damaging vegetable crops in Kashmir valley (India), with some new records. Journal of Entomological Research, 35 (1): 85- 91. Rahman, M.M., 2006. Vegetable IPM in Bangladesh, In: E. B. Radcliffe and W. D. Hutchison [Eds.]. Radcliffe's IPM world textbook. University of Minnesota, St. Paul, MN. USA. Rajotte, E.G., 2004. Integrated management of cucurbit fruit fly, Bactrocera cucurbitae Coquillett in Bangladesh. IPM CRSP Bangladesh Site Technical Bulletin No.1: 16. Riaz, M. and M. Sarwar, 2013. A new record of fruit fly Trupanea amoena (Frauenfeld) within genus Trupanea schrank of subfamily Tephritinae (Diptera: Tephritidae) from Pakistan. Journal of Zoological Sciences, 1 (2): 7-12. Riaz, M. and M. Sarwar, 2014. A New Record of Safflower Fly Acanthiophilus helianthi (Rossi) of Genus Acanthiophilus Becker in Subfamily Tephritinae (Diptera: Tephritidae) from the Fauna of Pakistan. Journal of Agriculture and Allied Sciences, 3 (1): 39-44. Ronald, J.B. and W. Celeste, 2009. Integrated pest management for the home vegetable garden. Agriculture and Natural Resources, HYG-2205-09. The Ohio State University. p 5. Sarwar, M., 2004. Some observations on the management of turnip insect pests. Economic Review- 11/12, 35(4): 48-50. Sarwar, M., 2005. Insect pests management stratagem for carrot production. Economic Review- 4, 36 (4): 28-30. Sarwar, M., 2012. Frequency of insect and mite fauna in chilies Capsicum annum L., Onion Allium cepa L. and Garlic Allium sativum L. Cultivated areas, and their integrated management. International Journal of Agronomy and Plant Production, 3 (5): 173-178. Sarwar, M., 2013. Integrated pest management (IPM) - A constructive utensil to manage plant fatalities. Journal of Agriculture and Allied Sciences, 4 (3): 1-4. Sarwar, M., 2014 a. The propensity of different larval stages of lacewing Chrysoperla carnea (Stephens) (Neuroptera: Chrysopidae) to control aphid Myzus persicae (Sulzer) (Homoptera: Aphididae) evaluated on Canola Brassica napus L. Songklanakarin Journal of Science and Technology, 36 (2): 143-148. Sarwar, M., 2014 b. Knowing About Identify and Mode of Damage by Insect Pests Attacking Winter Vegetables and Their Management. Journal of Ecology and Environmental Sciences, 2 (4): 1-8. Sarwar, M., M. Hamed, B. Rasool, M. Yousaf and M. Hussain, 2013. Host preference and performance of fruit flies Bactrocera zonata (Saunders) and Bactrocera cucurbitae (Coquillett) (Diptera: Tephritidae) for various fruits and vegetables. International Journal of Scientific Research in Environmental Sciences, 1 (8): 188-194. Steinmetz, K.A. and J.D. Potter, 1996. Vegetables, fruit, and cancer prevention: A review. J. Am. Diet Assoc, 96 (10): 1027-1039. Vainio, H. and F. Bianchini, 2003. Fruits and vegetables. Handbooks of Cancer Prevention, the International Agency for Research on Cancer (IARC). Lyon, France: IARC Press: Vol 8. Whitaker, J.M., 2001. Reversing diabetes. New York: Warner Books Inc. 446. Woodruff, S.L., 1995. Secrets of fat-free cooking: Over 150 fat-free and low-fat recipes from breakfast to dinner-appetizers to desserts. Garden City Park, N.Y: Avery Publishing Group.